A beginner’s tutorial highlighting the basics of SfePy. This primer presents a step-by-step walk-through of the process to solve a simple mechanics problem. The typical process to solve a problem using SfePy is followed: a model is meshed, a problem definition file is drafted, SfePy is run to solve the problem and finally the results of the analysis are visualised. 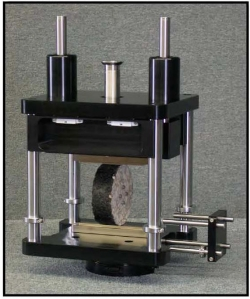 A popular test to measure the tensile strength of concrete or asphalt materials is the indirect tensile strength (ITS) test pictured below. In this test a cylindrical specimen is loaded across its diameter to failure. The test is usually run by loading the specimen at a constant deformation rate of 50 mm/minute (say) and measuring the load response. When the tensile stress that develops in the specimen under loading exceeds its tensile strength then the specimen will fail. 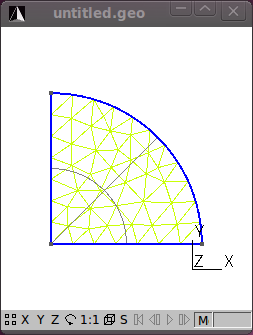 To model this problem using finite elements the indirect tensile test can be simplified to represent a diametrically point loaded disk as shown in the schematic. 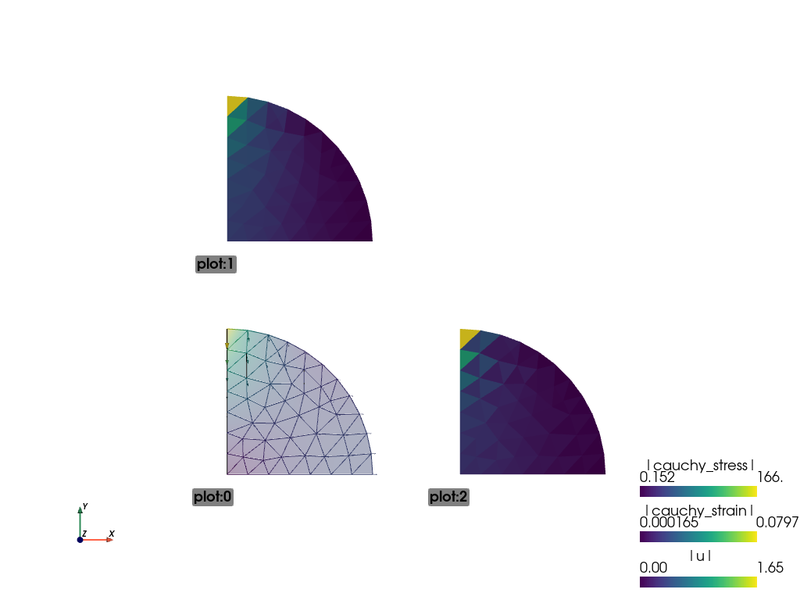 These solutions may be approximated using finite element methods. To solve this problem using SfePy the first step is meshing a suitable model. The ITS specimen has a diameter of 150 mm. Using Gmsh add three new points (geometry elementary entities) at the following coordinates: . Next add two straight lines connecting the points. 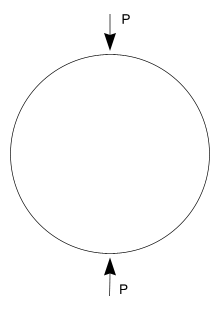 Next add a Circle arc connecting two of the points to form the quarter circle segment. Still under Geometry add a ruled surface. With the geometry of the model defined, add a mesh by clicking on the 2D button under the Mesh functions. The figures that follow show the various stages in the model process. That’s the meshing done. Save the mesh in a format that SfePy recognizes. For now use the medit .mesh format e.g. its2D.mesh . Hint: Check the drop down in the Save As dialog for the different formats that Gmsh can save to. If you open the its2D.mesh file using a text editor you’ll notice that Gmsh saves the mesh in a 3D format and includes some extra geometry items that should be deleted. Reformatted the mesh file to a 2D format and delete the Edges block. Note that when you do this the file cannot be reopened by Gmsh so it is always a good idea to also save your meshes in Gmsh’s native format as well (Shift-Ctrl-S). Click here to download the reformatted mesh file that will be used in the tutorial. You’ll notice that the mesh contains 55 vertices (nodes) and 83 triangle elements. 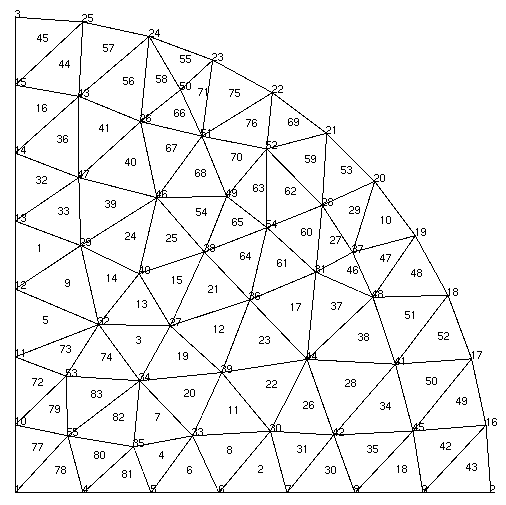 The mesh file provides the coordinates of the nodes and the element connectivity. It is important to note that node and element numbering in SfePy start at 0 and not 1 as is the case in Gmsh and some other meshing programs. To view .mesh files you can use a demo of medit. After loading your mesh file with medit you can see the node and element numbering by pressing P and F respectively. The numbering in medit starts at 1 as shown. Thus the node at the center of the model in SfePy numbering is 0, and elements 76 and 77 are connected to this node. Node and element numbers can also be viewed in Gmsh – under the mesh option under the Visibility tab enable the node and surface labels. Note that the surface labels as numbered in Gmsh follow on from the line numbering. So to get the corresponding element number in SfePy you’ll need to subtract the number of lines in the Gmsh file + 1. Confused yet? Luckily, SfePy provides some useful mesh functions to indicate which elements are connected to which nodes. Nodes and elements can also be identified by defining regions, which is addressed later. Another open source python option to view .mesh files is the appropriately named Python Mesh Viewer. The next step in the process is coding the SfePy problem definition file. Download the Problem description file and open it in your favourite Python editor. Note that you may wish to change the location of the output directory to somewhere on your drive. You may also need to edit the mesh file name. For the analysis we will assume that the material of the test specimen is linear elastic and isotropic. We define two material constants i.e. Young’s modulus and Poisson’s ratio. The material is assumed to be asphalt concrete having a Young’s modulus of 2,000 MPa and a Poisson’s ration of 0.4. Note: Be consistent in your choice and use of units. 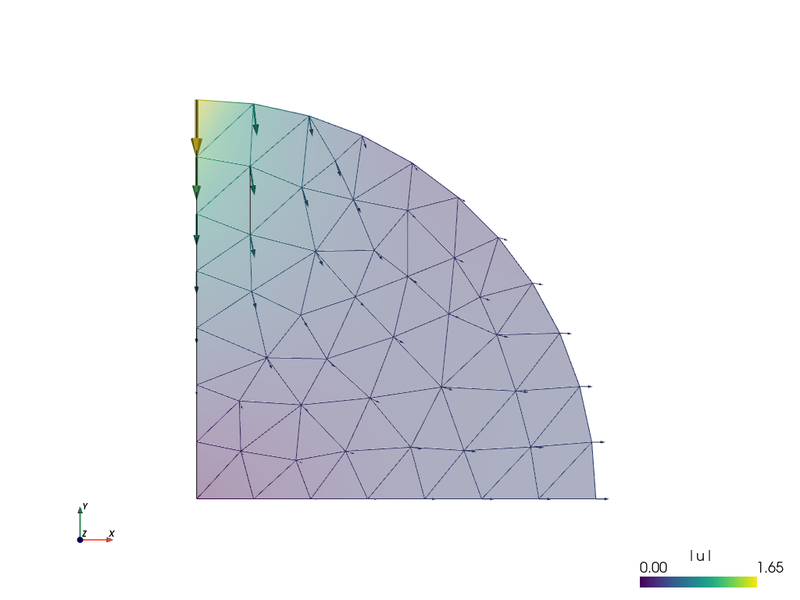 In the tutorial we are using Newton (N), millimeters (mm) and megaPascal (MPa). The sfepy.mechanics.units module might help you in determining which derived units correspond to given basic units. ‘Top’ : the topmost node. This is where the load is applied. Now the power of the regions entity becomes apparent. To ensure symmetry about the x-axis, the vertical or y-displacement of the nodes in the ‘Bottom’ region are prevented or set to zero. 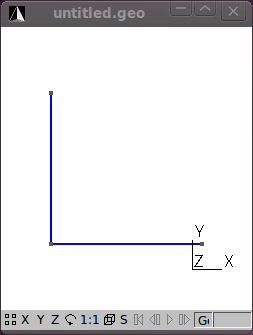 Similarly, for symmetry about the y-axis, any horizontal or displacement in the x-direction of the nodes in the ‘Left’ region or y-axis is prevented. Note the dot in ‘.val’ – this denotes a special material value, i.e., a value that is not to be evaluated in quadrature points. The load is then applied in equations using the ‘dw_point_load.0.Top(Load.val, v)’ term in the topmost node (region ‘Top’ ). Hint: Check out the sfepy.mechanics.matcoefs module for other useful material related functions. That’s it – we are now ready to solve the problem. Note: For the purpose of this tutorial it is assumed that the problem description file (its2D_1.py) is in the same directory as the simple.py script. If you have the its2D_1.py file in another directory then make sure you include the path to this file as well. SfePy solves the problem and outputs the solution to the output path ( output_dir ) provided in the script. The output file will be in the VTK format by default if this is not explicitly specified and the name of the output file will be the same as that used for the mesh file except with the ‘.vtk’ extension i.e. its2D.vtk. VECTORS (the node displacements in the x-, y- and z- directions). The postproc.py script generates the image shown below, which shows by default the displacements in the model as arrows and their magnitude as color scale. Cool, but we are more interested in the stresses. To get these we need to modify the problem description file and do some post-processing. SfePy provides functions to calculate stresses and strains. We’ll include a function to calculate these and update the problem material definition and options to call this function as a post_process_hook() . Save this file as its2D_2.py. 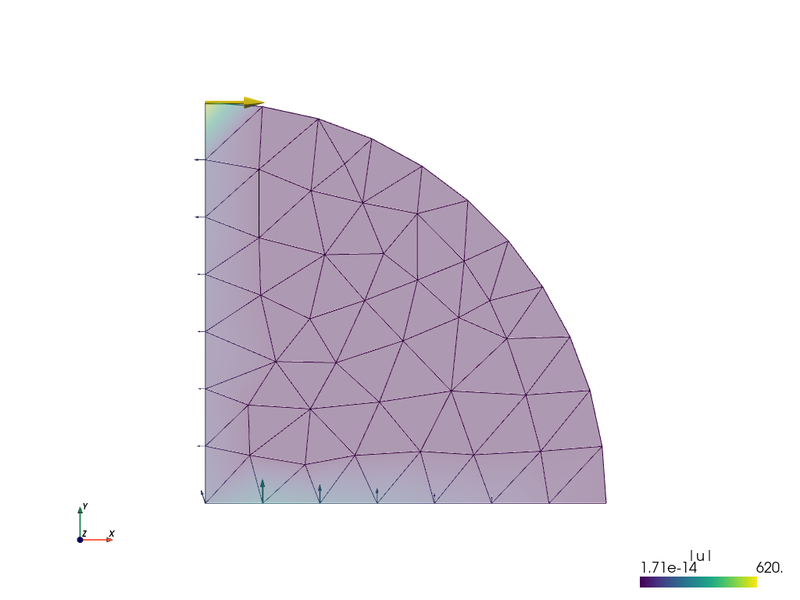 Calculate and output strain and stress for given displacements. The updated file imports all of the previous definitions in its2D_1.py. The stress function ( de_cauchy_stress() ) requires as input the stiffness tensor – thus it was necessary to update the materials accordingly. The problem options were also updated to call the stress_strain() function as a post_process_hook() . Remember the objective was to determine the stresses at the centre of the specimen under a load . The solution as currently derived is expressed in terms of a global displacement vector . The global (residual) force vector is a function of the global displacement vector and the global stiffness matrix as: . Let’s determine the force vector interactively. In addition to solving problems using the simple.py script you can also run SfePy interactively (we will use IPython interactive shell in following examples). Both state() and state.get_parts() return a view of the DOF vector, that is why in Out the vector is reshaped according to Out. Great, we have an almost zero residual vertical load or force apparent at node 2 i.e. -1.13686838e-13 Newton. Let us now check the stress at node 0, the centre of the specimen. Previously we had calculated the stresses in the model but these were averaged from those calculated at Gauss quadrature points within the elements. It is possible to provide custom integrals to allow the calculation of stresses with the Gauss quadrature points at the element nodes. This will provide us a more accurate estimate of the stress at the centre of the specimen located at node 0. The code below outlines one way to achieve this. Calculate stresses at nodal points. To wrap this tutorial up let’s explore SfePy’s probing functions. As a bonus for sticking to the end of this tutorial see the following Problem description file that provides SfePy functions to quickly and neatly probe the solution. Probing applies interpolation to output the solution along specified paths. For the tutorial, line probing is done along the x- and y-axes of the model. The probing function will generate the following figures that show the displacements, normal stresses and strains as well as shear stresses and strains along the probe paths. Note that you need matplotlib installed to run this example. The probing function also generates previews of the mesh with the probe paths. :ref:`linear_elasticity-its2D_4`, and how to display the results using Mayavi. approximation order greater than one. Matplotlib use the same backend type (for example wx). # Use enough points for higher order approximations. 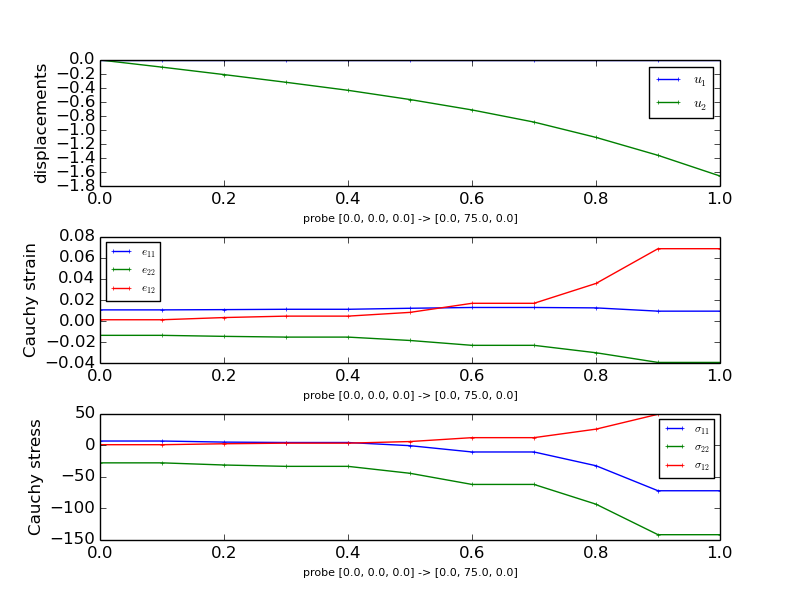 Probe the results using the given probe and plot the probed values. 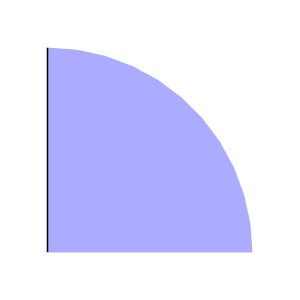 'load' : "the vertical load value (negative means compression)"
# Build the problem definition. # extra DOFs are simply thrown away. probe the solution defined in the field variables. 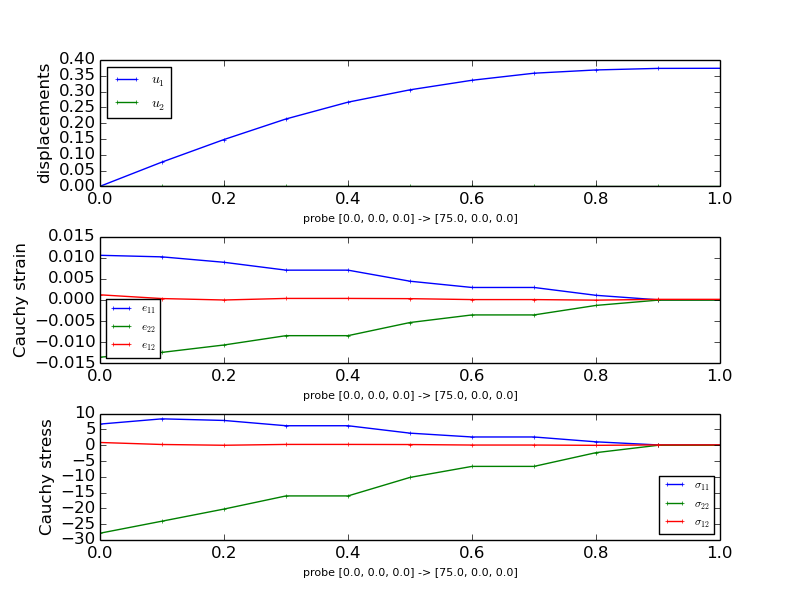 Using sfepy.discrete.probes allows correct probing of fields with the approximation order greater than one.